Guests will be asked to pay the rate of the first night in order to confirm their hotel booking. What if your travel plans change? Don't worry. With azuLinehotels you may cancel your booking and get a complete refund up to 48-hours prior to your arrival at no additional charge, and seven days before for bookings made for July and August. Book now at BEST PRICE GUARANTEED! Our apartments and hotels located in Ibiza and Majorca offer you everything you need to make your vacation an unforgettable experience with your friends, partner or family. Welcome to azuLinehotels, a hotel chain with more than 20 years of experience in the tourism sector. Our wish is to fulfil our guests' expectations, placing the type of accommodation that best suits your needs and preferences at your disposal. We aim for quality tourism at the best price, with a team of highly qualified and motivated customer service professionals. 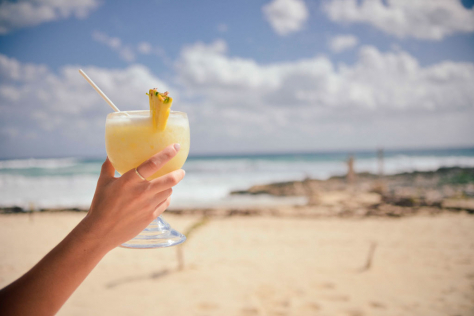 Enjoy your stay in Ibiza or Majorca with azuLinehotels! Equipped with multiple services and facilities, our apartments and hotels are chosen each year as tourist destination on the island of Ibiza. 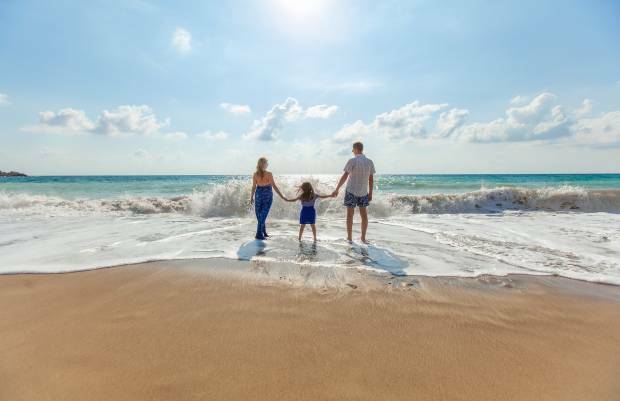 Families, couples and young people choose our hotel chain to enjoy their holidays. 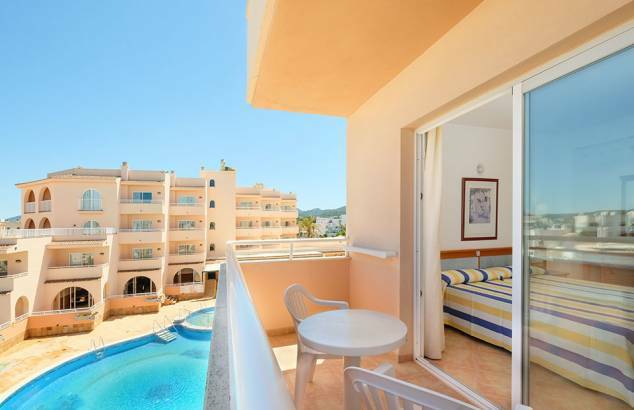 Discover our apartments and hotels located in the best vacation areas on the island: San Antonio and San Antonio Bay, Santa Eulalia and Es Canar. Enjoy a unique and unforgettable experience at azuLine Hotel Atlantic, azuLine Hotel Bergantin, azuLine Hotel Coral Beach, azuLine Hotel Mar Amantis I & II, azuLine Hotel Pacific, azuLine Hotel Galfi, azuLine Club Cala Martina Ibiza, azuLine Hotel Mediterraneo, azuLine Hotel S 'Anfora & Fleming, azuLine Hotel Llevant and azuLine Sunshine Apartments. 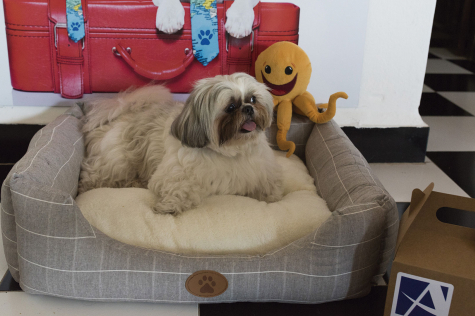 Perfect for spending some fantastic, comfortable time, full of good times, sunny days and unforgettable nights! Majorca is an island that the traveller falls in love with. Incredible natural landscapes and a wide range of leisure make it the ideal plan for a family holiday or a getaway for couples or friends. Located in El Arenal, azuLine Hotel Bahamas & Bahamas II are ideal for discovering the magic of the island of Majorca. Let yourself be captivated by its essence! With the azuLinehotels guarantee. What plan do you take?The Hotels AzuLinehotels are chosen each year as a tourist reference. azuLine Aparthotel Rosamar is located in San Antonio Bay, a mere 200 metres from the beach and only a few minutes' walk from the famous Cala Bassa and Cala Conta. It is also close to a large variety of restaurants and leisure activities. 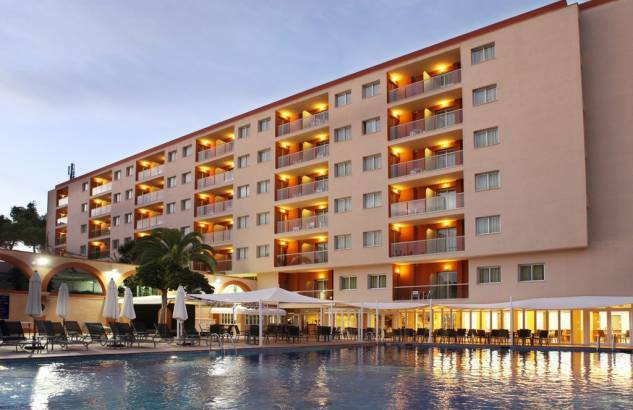 Fully renovated in 2013, with a modern design throughout the building, the hotel is ideal for everyone who wishes to spend a few days having fun on the island and see the extensive night-time leisure of San Antonio. 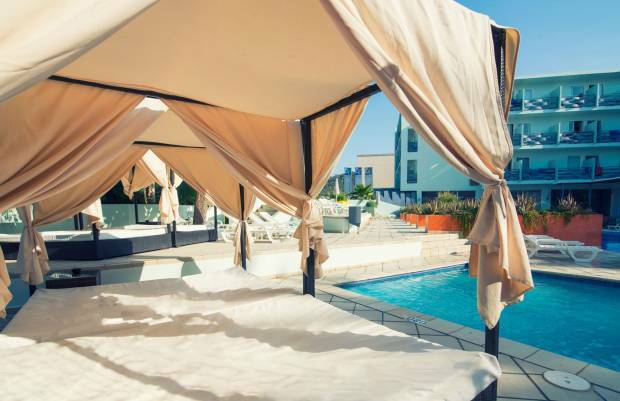 azuLine Hotel Pacific is located just metres from the seafront of San Antonio, one of the most important tourist areas on the island of Ibiza. The urban centre is 200 metres from the hotel with a wide range of businesses, shops and restaurants of all kinds. 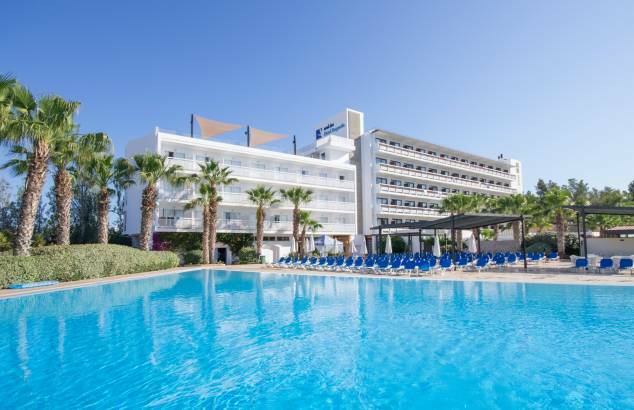 azuLine hotel Mar Amantis is located in Bahía de San Antonio in Ibiza, one of the most important tourist areas of the island, on the beachfront with a wide variety of shops, restaurants and leisure facilities nearby. 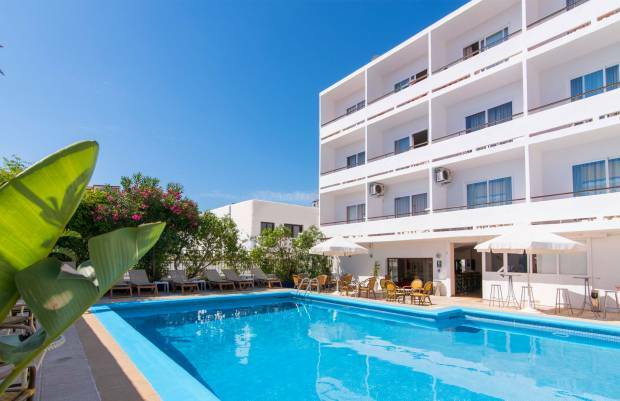 azuLine hotel S´Anfora & Fleming is located between San Antonio and Bahía de San Antonio, one of the largest tourist areas of the island of Ibiza, a few minutes from the beach, famous nightclubs and sunsets. azuLine Hotel Mediterraneo is ideal for couples looking to relax in a charming location near the beach. 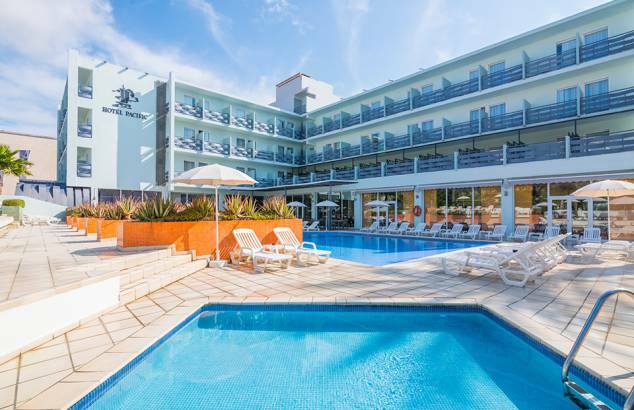 It is a very quiet hotel but is also located a few metres from the pedestrian area at the centre of Santa Eulalia, where there is a wide range of bars, restaurants and leisure activities. 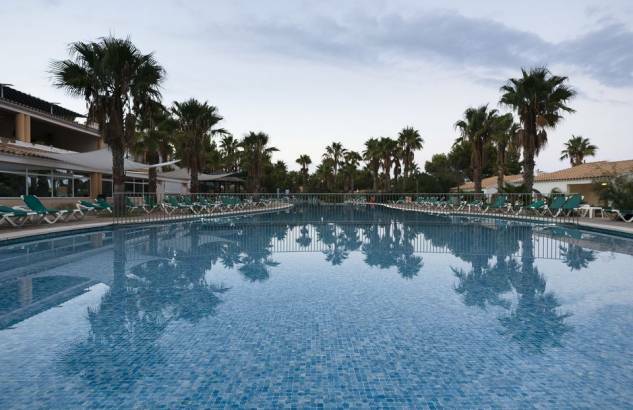 azuLine hotel Coral Beach is located just 50 metres from the tranquil Es Canar beach and 150 metres from Cala Nova, very close to the bars, shops and restaurants of this quiet area of the island. 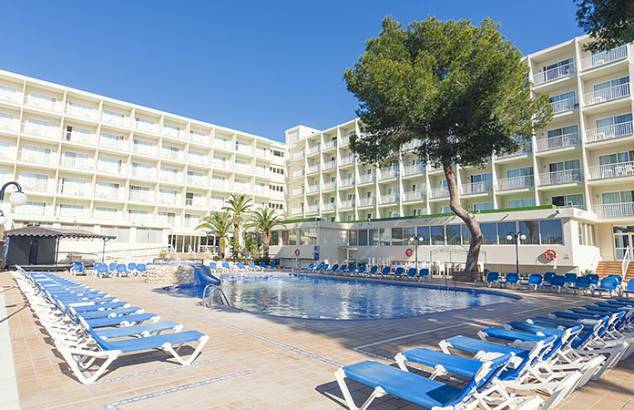 Santa Eulalia is located just 4km away. 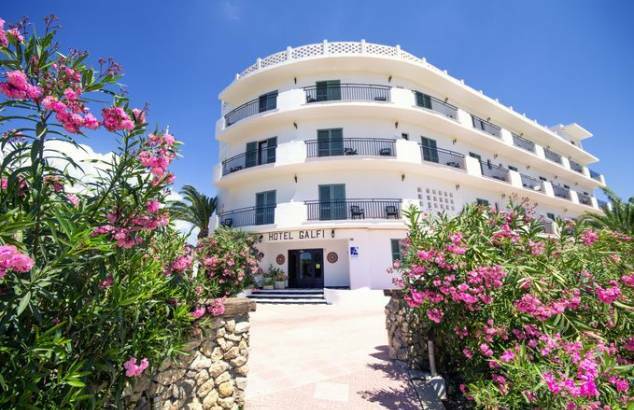 azuLine Hotel Galfi is located on one of the main streets into San Antonio, just 800 metres from the urban centre and a few metres from the seafront and popular leisure facilities such as the Ocean Beach Club. 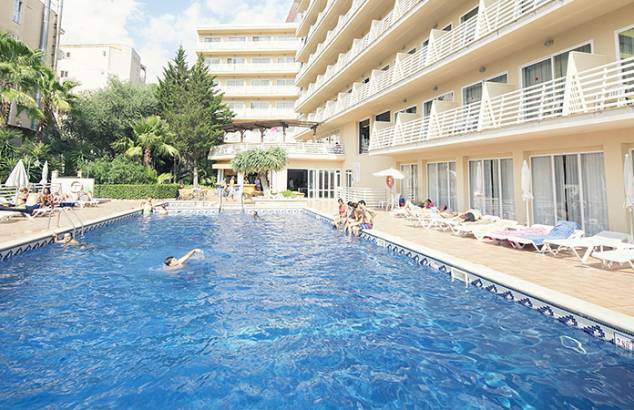 Hotel Atlantic is located in Es Canar, just 200m from the beach, near a wide variety of restaurants and bars. 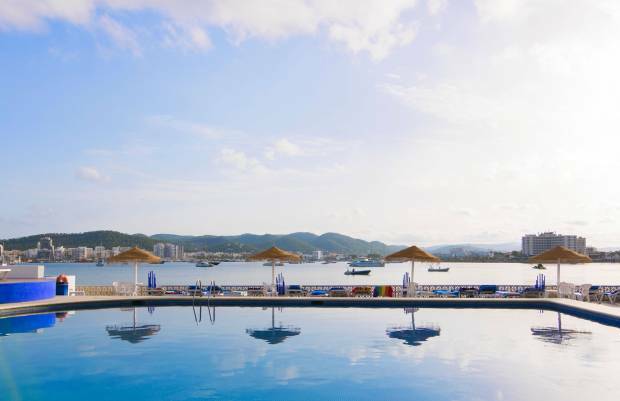 The hotel is ideal for those looking to enjoy their family holiday in one of the calmest areas of the island of Ibiza. 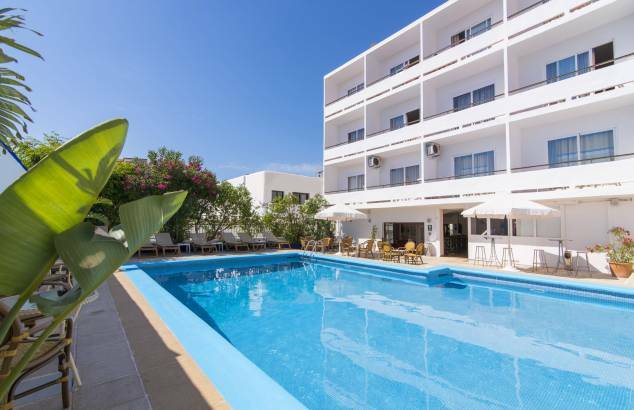 azuLine Hotel Bergantín is located in Bahía de San Antonio de Ibiza, one of the most important tourist areas of the island, 100 metres from the beach and with a wide variety of shops, restaurants and leisure facilities nearby. 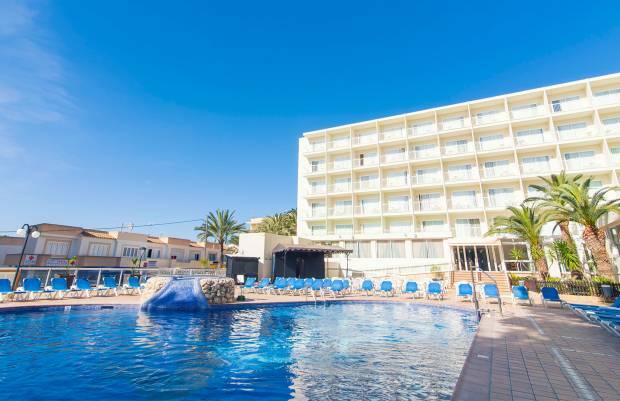 The azuLine Sunshine apartments are found in the Cala de Bou complex, just 100 metres from the beach. In the area you will find a wide variety of shops, bars, restaurants and establishments for night-time leisure. Our offersEnjoy exclusive benefits only if you book through our website. We wait for you! Book now and enjoy of an extra 30% discount for stays from 27th of May until 15th of June. Please enter the age of the child at the arrival at the hotel to check if you are entitled to the discount. Important: Please bring child's id or passport. Book now and benefit of an extra 10% discount for stays from 5th to 21st of May. Book directly in our website and enjoy free WIFI during your stay. First child for free sharing with two adults the whole season except July and August in all inclusive service with a suplement of 10 euros per day. Book now and benefit of an extra 15% discount for stays from 17th to 21st of May. Book now and benefit of an extra 20% discount for stays from 22nd to 29th of May. 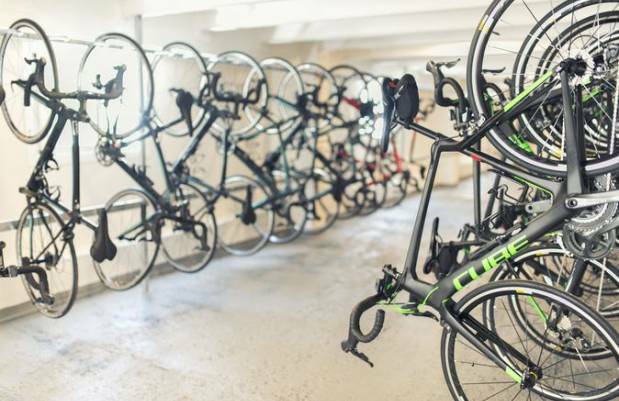 azuLine Hotel Bahamas and Bahamas II offers a Premium Pack-Bike Room for all those who want to enjoy cycling during their vacations. Pack-Bike Room Servicies: Cyclist Welcome Pack, use of cycling tools for professional cyclists, access to the Cycling Center with hangers and security cables, Bike washing area, Free Spa access (single use). Book now and enjoy of an extra 20% discount for stays from 23rd of August to 3rd of September. Book now and enjoy of an extra 10% discount for stays from 21st of July to 28th of August. 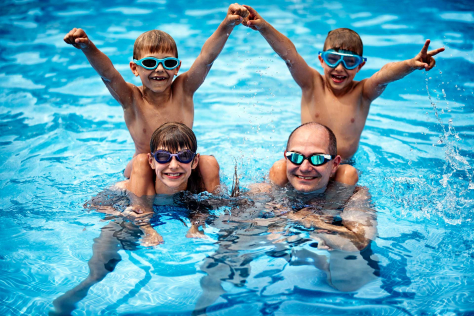 Book now and enjoy of an extra 15% discount for stays from 1st to 7th of July. Enjoy an extra 15% discount for stays from 15th to 24th of June and from the 1st to the 31st of July. Subscribe to our Newsletter and follow us on social networks to be the first to find out about all our news. In Azuline we like you to visit us again. Sign up for the loyalty program and enjoy great advantages and discounts on your next trip. Ask at the reception during your visit. Official Web Book here at the best price guaranteed!